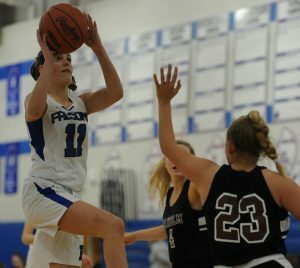 Rochester struggled in the first half, but the Falcons turned it around and dominated the second half for a 39-29 win over Birmingham Seaholm in a key OAA Blue girls basketball contest on Tuesday night at Rochester High School. Rochester improved to 6-6 overall and remained undefeated (6-0) in the OAA Blue while Seaholm is now 6-5, 4-2 in the Blue. 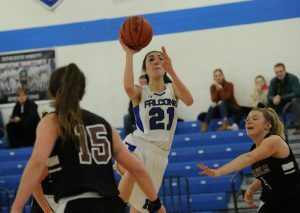 The Maples out-scored the Falcons, 13-7, in the second quarter to take a 20-13 lead at the half. Then the Falcons came out fired up and scored the first 14 points in the third quarter to take a 27-20 lead. The Falcons were much more energized to start the third quarter. Rochester outscored the Maples 26-9 in the second half. “I think their energy was a lot higher, Rochester played a much better game than us in the second half. We came out lethargic, we were slow, couldn’t get the shots,’’ Seaholm coach Chris Manchester said. “So we had more turnovers than shots in the second half, steals, silly mistakes, a lot of mistakes by us — things we can work on in practice,’’ Manchester added. Meredith Owens led the Maples with 9 points. 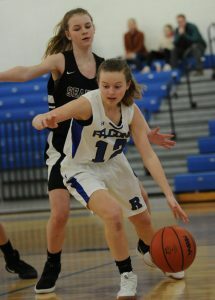 For the Falcons, sophomore guard Megan Lorenzo led with a dozen points while senior Tori Hawkins scored 10. Haney said he doesn’t have a standout player or two. “We have a lot of people who kick it in and have done a really good job. I’m proud of them for coming back in the second half after things weren’t good in the first half,’’ Haynes said. Next up for Rochester is a home game against Pontiac at 7 p.m. on Friday. The Maples are at home on Thursday hosting Walled Lake Northern.